Generates glows based on the distances from the edges of the source input. Any edges in the input image, where the brightness crosses the given threshold value, will generate an equally bright glow into the darker side of the edges. 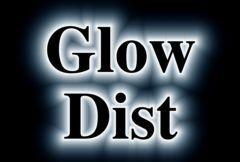 This is similar to GlowDist but here the glow colors are also scaled by the Mask input. Width: Default: 0.2, Range: 0 or greater. Scales the red glow distance. If the red, green, and blue widths are equal, the glows will be a single color given by the Color parameter. If they are not equal, the glows will vary in color with distance. Brightness: Default: 0.8, Range: 0 or greater. Scales the brightness of the glows. Glows are generated at the edges of areas in the source clip that are brighter than this value. A value of 0.9 causes glows from only the brightest spots. A value of 0 causes glows for every non-black area.